Ahead of the release of the next month’s upcoming Hearthstone expansion, Rise of Shadows (which also happens to usher in the fiery Year of the Dragon), we’ve got a brand-new card to show you. This time around, we’re showing off Hecklebot, perfect for those of you who want to make sure your opponents hate you by the end of the game. Hecklebot is a rare, four mana 3 /8 neutral card. He doesn’t have too much in terms of damage, but that’s at least partly made up for by a decent health pool, which is further boosted by Hecklebot’s taunt effect. 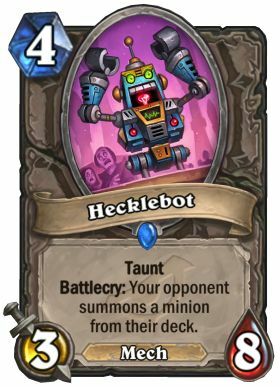 If that taunt wasn’t annoying enough, however, Hecklebot comes with an effect that’s sure to wind up your opponents, albeit in a roundabout way. The minion’s battlecry means that as soon as you play it, your opponent will summon a minion from their deck, too. If that sounds familiar, that’s because you might have seen a similar effect from cards like Dirty Rat and Deathlord, both of whom force your enemies to play a minion. Blizzard says that this is helpful for if you’re trying to disrupt your opponents’ strategy. Forcing them to play a minion off-curve or without letting them trigger effects around it sounds like it could have a decent impact, and eight health and a taunt means you’ll be able to protect some of your other minions. Since Hecklebot is a mech, it should synergise well with Magnetic minions. All that said, however, I’m not convinced how effective Hecklebot will be towards the bottom of the ladder. It feels like a card designed to combat very specific decks, but potentially letting your opponent get their hands on an extra minion off your turn could open you up to a painful rebuttal. The new expansion is set to arrive on April 9, so to get you started, here’s a look at some of the Rise of Shadows cards we’ve seen so far.. 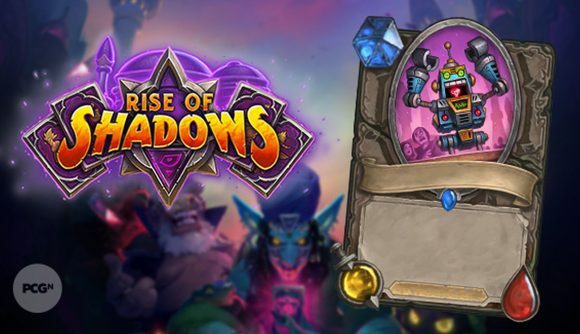 The first expansion of the new year is also set to kickstart a year-long narrative featuring some of Hearthstone’s biggest and best villains of the past few years.